After spending months using Grammarly's browser extension -- the Firefox add-on most often -- I have come to like and dislike the extension. You can check out my Grammarly Premium review for a rundown on features. In this article, I will concentrate on issues that I experienced while using Grammarly. I developed workarounds for some of them and don't consider them critical enough to stop using Grammarly, for now. I'm not sure whether I will extend my subscription once it runs out, however. This may not sound like such a bad thing at first glance; you do get a -- hopefully -- more capable spell checker and grammar checker in return. In Firefox at least, Grammarly does not underline issues so that I cannot correct them right away. I have to open the Grammarly interface to do so. All words that I added to the browser's dictionary are not imported by Grammarly. This means that I have to "teach" Grammarly to ignore words that I taught the browser to ignore already. 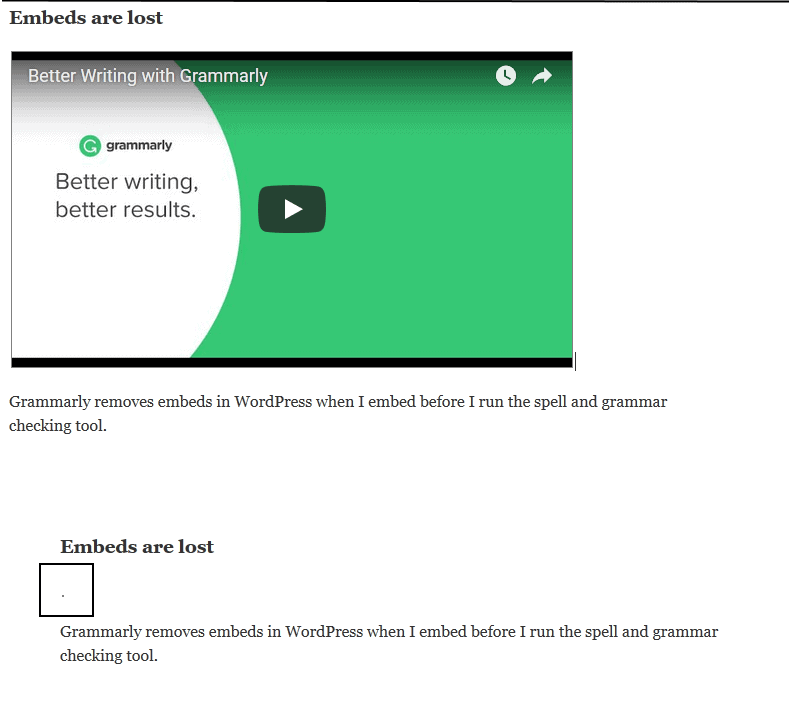 Grammarly removes embeds in WordPress when I embed before I run the spell and grammar checking tool. I only embed YouTube videos, but whenever I do, I need to make sure that I embed it after I check the article for spelling issues. I don't know how wide-spread the issue is, and whether it affects other embeds on WordPress or other platforms, or if it is limited to YouTube embeds when using WordPress. Adding links to articles that I write is important. This works the same way as before but with one notable exception. Words or phrases that are marked by Grammarly cannot be added to links until you either ignore the word or phrase, or correct it. This leads to situations where a link is divided into two or even more parts because of words that Grammarly flagged. When I use Grammarly's interface to fix errors, I sometimes notice that the cursor jumps around erratically. This interferes with my typing at times and leads to more issues as I need to correct the new issue caused by the jumping around. Also, when you write a word or phrase that Grammarly does not know (and thus thinks is incorrect), you may notice that the cursor jumps back a position to the end of that word after you hit space. This leads to situations where you add the next word right after the last without having a space between the two words. Grammarly's spell checker is quite good but it lacks a lot of tech words, phrases and acronyms. While I can understand that its directory does not know complex or specialized terms, it is surprising that its dictionary does not include common words or phrases. Now You: Do you use a spell checker or grammar checker like Grammarly? Yes a lack of a simple spell checker puts me off Firefox, using grammarly is too much of an overkill for a novice such as i am, why firefox could not have an inbuilt simple spell-checker such as in google is beyond me! Could you please update your Ghacks’ Blue Style to make the new button “report errors – request update” (at the end of articles) working? I’ll take a look at it over the weekend and see what I can do. I wonder if spellcheck was broken when FF 58 initially came out because I researched those settings and it still didn’t work for me. I just Firefox downloaded again after seeing your post, checked both the settings you recommended, both were already set. This time when I tested, it worked for me! Spellcheck has always worked for me. With the update from Firefox v56 to v57 I did do a clean install though because there were such big changes to the core (webextension only among other changes). Firefox doesn’t spellcheck input type=”text” by default, only textarea. I remember when this decision was made and I thought it was a smart decision. After using the browser with the spellchecker checking everything, I think it shouldn’t be the default behavior. I don’t know what Mozilla was thinking, but they probably didn’t do enough testing to come to that decision. I wonder if Grammarly by default accepts “whitelist”? In Chrome under Windows 10, only “white list” or “white-list” is accepted by default. I am annoyed I have to manually add “whitelist” to its database. I’ve been using the LanguageTool webextension and it works well. A couple weeks ago I lost a comment after trying to submit it, but I was using Nightly at the time and I’m not sure if it was the browser or the webext that caused the problem. Like Grammarly it’s missing tech words, phrases and acronyms. May want to try Ginger or Hemingway, but the use of any type of grammar/spell checking tool requires the user to already possess a relatively good understanding of grammar and excellent spelling skills. In the article above, the word “this,” which is one word that makes most English professors cringe, is used so often that, if I were the editor, I would send the article back for a rewrite. Many other problems exist in the writing that would take a trained writer to explain and fix–not something Grammarly does. For example, the sentence “I don’t know how wide-spread the issue is, and whether it affects other embeds on WordPress or other platforms, or if it is limited to YouTube embeds when using WordPress” needs revision because the parallel structure is awkward. Grammarly does provide a plagiarism checker that is superior in all aspects. The tool in Office Word suffices for most users, and reading the writing out loud makes the flow and intent of the language used a much better tool for writing and improving one’s writing than any other method. The cursor problem isn’t much different than the erratic jumping around from first person to second person to third person in writing. Grammarly won’t explain how the problem can be fixed or how to rewrite a passive voice sentence and make it active voice. I know I’m going to be needing it I use Chrome. I have been using Language Tool (https://www.languagetool.org) for a few months now. For me and my work flow it was the perfect fit. I however am still using legacy Firefox so I can’t comment on the webext. Grammar checkers are something I avoid. There are too many instances of contradictory statements made due to people’s language backgrounds, and their acquisition of the English language. This is not to mention things like dialect – England, USA, Australia, Nigeria. I don’t think that kind of burden should be scrutinised any more. As for spelling, that is quite important. A speiling missake (<– on purpose) sticks out, and diverts a person's attention from the message to "how did that idiot not see that mistake??? ", or some comedic point of view. Both take away the focus from the article. These stated, as much as grammar can cause a misunderstanding, people should have the nouse to be able to work out what the person means, for the majority of the occasions. I also blame society for their deliberate dumbing down of society through advertising distractions, drone music with some rapper speaking to music, and political campaigns based on rubbish and sewage. Current spelling for most people takes into account mobility. Particularly in chat, and of course many people now use chat norms for all spelling. It’s a bit weird, but people write all day long now, in a variety of emotional states. Most people don’t notice spelling mistakes, humans see words as a single picture. Your comments about “society” have been a constant since language was invented. Seems you don’t like rappers speaking to music, but I invite you to mute the music and subject the structure to rigorous analysis, this is poetry, poetry in a vernacular you may not care for, but poetry nonetheless. Political campaigns appeal to the lowest common denominator, it’s true, but nobody really knows how politics and economics come together on a theoretical level, in order to enfranchise people, they need to know how policies affect them. Languages tend to simplify over time, and have always done so. Different accents, migration of second language speakers, and things like palatalization tend to interfere with inflected word endings, and complex case structures usually break down into definite articles + verb. While I agree with your general sentiment, I don’t think you can so blithely call someone an idiot, for a spelling mistake, especially online. Most people write things on their phones. What I use is proselint (http://proselint.com/). I set it as my makeprg for text files in vim, or run it against completed text. Less of a grammar checker than a style guide, which works better for me, since the style guide is what you want. Grammatical rigor does not necessarily make for readable prose. I use Grammarly on Chrome without any problems. It is a great program and I use the free version. If you mistype a word it underlines it in red and offers the correct spelling. It also offers grammar corrections which most of the time are correct. I use spell checkers sometimes, then check suggestions that look misspelled. I’ve given up on algorithms doing anything remotely intelligent but if someone is writing in multiple languages, grammar and spelling aids can be very helpful with preventing nonsense or unintentional insults. I thought Grammarly’s name was a joke when the product first appeared, designed to attract those whose grammar is adverbally challenged. Beyond the odd and still prevalent hyphenated spelling suggestions, grammar checkers can completely change the meaning of sentences if writers don’t have at least a reasonable understanding of how to express intent. If intent is lost, style is irrelevant unless confusion or mystery are intended. Online, I see more ambiguity from missing words than spelling or grammar errors. “The expert skier recounted, ‘I focused on nothing but skiing as fast as possible approaching avalanche. '” One assumes the skier was attempting to outrun an avalanche and did so, instead of the written run toward an avalanche. Who knows? Social media inspires people to livestream crazy things!